Your discovery process involves electronic evidence and electronically stored information (ESI) more than ever before. Mastery of e-discovery is essential—whether you need a basic understanding of the language and the risks, or need advice on managing ESI and uncovering hidden electronic evidence. All litigators must stay apprised on how courts are ruling on electronic discovery issues. 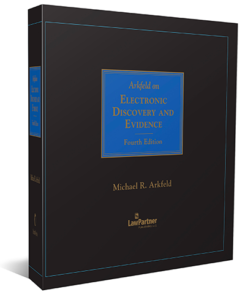 Arkfeld on Electronic Discovery and Evidence, Fourth Edition, (updated biannually), and four Best Practice Guides, provide comprehensive guidance, with clear explanation of the technical concepts, as well as discussion of the latest legal developments in this area. BEST VALUE! Your purchase of the 1,500 page treatise includes a copy of each of the four companion Best Practices Guides, which are cross-referenced to the treatise and a companion downloadable ebook file which contains all the publications, forms, and other resources. To save 30% on Arkfeld on Electronic Discovery and Evidence, Fourth Edition or the four Best Practice Guides, please reference or enter promotion code: AZBAR30. “Michael Arkfeld’s treatise on e-discovery is peerless among print publications. No other volume offers the encyclopedic treatment of the topic and its depth and breadth of scholarship. Michael Arkfeld lucidly weaves practical knowledge gleaned from years at the bar with a professorial commitment to case law and best practices. Though books on fast-moving topics are obsolete almost from the moment of publication, the loose-leaf format and ancillary online resources of the Arkfeld work insure that it can continue to deliver the best features of both media. ESI Pretrial Discovery – Strategy and Tactics. The Fourth Edition of Arkfeld on Electronic Discovery and Evidence is a comprehensive treatise that addresses all the key aspects of the discovery and admission of electronic evidence, within the context of relevant statutes, regulations, and federal and state case law. 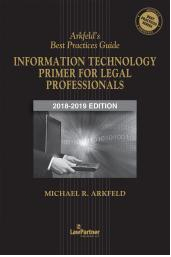 The new edition of Arkfeld’s Best Practices Guide: Information Technology Primer for Legal Professionals, is a resource for understanding the “information technology infrastructure” of organizations, locating “electronically stored information” (ESI), and managing it using computer technology. This primer is intended to be used as a general reference for the identification, preservation, collection and disclosure of ESI. The new edition of the Best Practices Guide for Legal Hold provides strategic guidance, recommendations and practice forms necessary in preparing for and implementing a “legal hold.” It covers the components of a legal hold readiness plan to identify, preserve, collect, process and review electronic data for disclosure in a timely manner. Features include sample legal hold procedures and forms for an organization, preservation notice letters for clients and opposing counsel, and a section on information technology discovery questions. The new edition of Arkfeld’s Best Practices Guide: ESI Pretrial Discovery — Strategy and Tactics contains procedural steps, strategy and substantive law considerations related to the pretrial discovery of “electronically stored information” (ESI). These practices are intended to be used as general guidelines for the discovery and production of ESI. Depending on the unique issues of your case, these suggested practices may necessitate a different approach and should be considered on a case-by-case basis. The new edition of the Best Practices Guide for Electronic Discovery and Evidence offers an overview and workbook for the myriad legal and technological issues that need to be addressed whether you are requesting or producing “electronically stored information” (ESI). The workbook provides a plan and pretrial steps for discovering and disclosing ESI. Also included is a “meet and confer” planning guide outlining the key topics and questions for a pretrial conference.